Hardscape features are a staple of most cottage gardens; but that doesnt mean you have to install a picket fence. This design uses a simple pathway arch arbor to mark the boundary of the property. Climbing roses are a traditional choice for such an arbor. However, this homeowner has chosen a thornless vine that is less likely to snag visitors. The plants in this garden are mostly self-seeding perennials. This makes the landscaping easy to maintain from year to year. The key to creating the old-time cottage feel is making sure there are no straight lines or clear divisions between plant types. Every bed should look like a bouquet with clumps and clusters of one plant blending into the next. This means you need to pick a wide variety of plants that do well with the same soil/water/sun combo. Stay away from aggressive species that will crowd out your other plants and create a homogenous bed. Its OK to let a few native weeds grow among your carefully selected cultivars if they have pretty foliage or flowers. They wont be noticed. A little Beatrix Potter décor is a nice touch for your English cottage garden. The messy, slightly wild appearance of this landscaping style gives you ample opportunity to incorporate animal statuary. Just stick with rural country species like hedgehogs and rabbits. A lion or toucan would stick out like a sore thumb. From a design standpoint, a cottage garden gives you a lot of leeway. However, it is a good idea to at least pick a broad color theme to offer some visual consistency. Mixing flaming orange with pale blue is just too jarring to be pleasant. In the garden above, Pamela has decided on pastels with lavender undertones - mixing blues and pinks that all have the same dusty warmth. 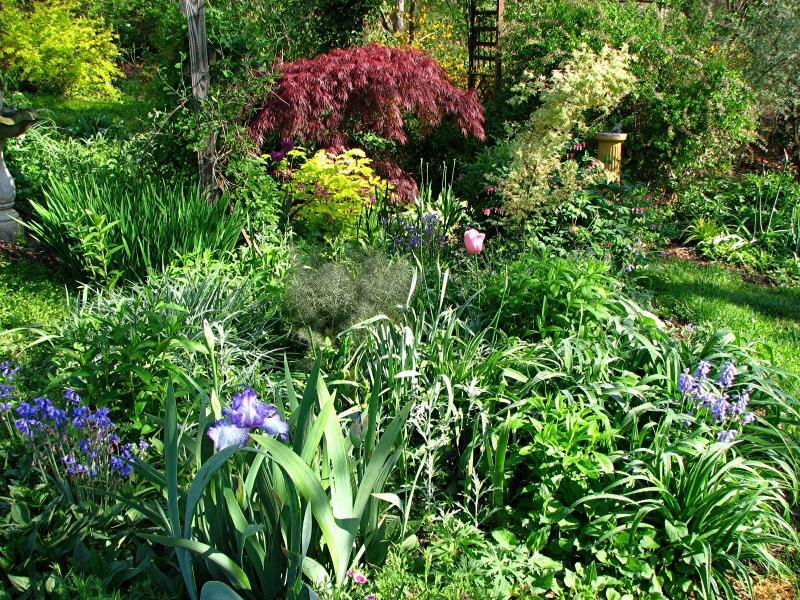 The area still looks natural, but the planning pays off by making the garden soothing and appealing.